Having electrical devices on a switch can make it very convenient to cut power to electrical devices, and cutting power to electrical devices when you’re not using them saves money. The problem is that most of our electrical devices are not hooked up to switches. Instead, they just sit there, plugged in, sucking down some amount of phantom power all the time. Our microwave, for example, uses about 11 watts on standby mode (meaning all the time it’s plugged in but not in use). I figured this out using a Kill-A-Watt meter. Let’s just look at those three kitchen appliances, though. Our microwave, toaster, and blender use 15.75 watts all the time. Let’s say we use our microwave five times a week, our blender four times a week, and our toaster three times a week. The effort to plug in and unplug each device takes about five seconds, so to plug in and unplug all of these devices for each use during a given week takes exactly a minute. 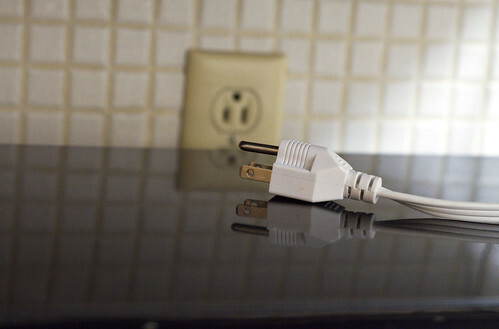 So, how much energy would we save by plugging and unplugging the devices? About $0.40 in saved energy costs. Assuming you could plug in and unplug a device at that rate for an entire hour, you’d make $24 an hour, which is about what you’d accomplish over an entire year. For some people, though, this won’t be worth it. In that case, save your plugging and unplugging until just before you leave on a trip. Let’s say you go on a ten day trip and you have those three devices in your kitchen. If you unplug them all before you leave and plug them in when you get home, you’ve invested fifteen seconds of your time. You’ve also saved $0.60. Would you bend over and pick up two quarters and a dime if you saw them on the ground? Not only that, many electrical devices in your home use energy while just sitting there. There’s no reason not to unplug as much as you can before you leave on a trip and then plug them each back in as you try to use them when you get home. Yes, this is a small money saver, but it’s one that doesn’t require much effort, either. You can do this almost without thinking about it, and your energy bill goes down a little bit. That’s very worthwhile in my eyes.